This week, we will transition from our warm, spring-like weather to the cold, overcast, late winter feels of Utah. The synoptic pattern is becoming more active again, which will bring several rounds of precipitation to both the valley and mountains. Forecast uncertainties exist, but it will snow, and hopefully a lot. So let’s break this down into what we know and what we don’t know. 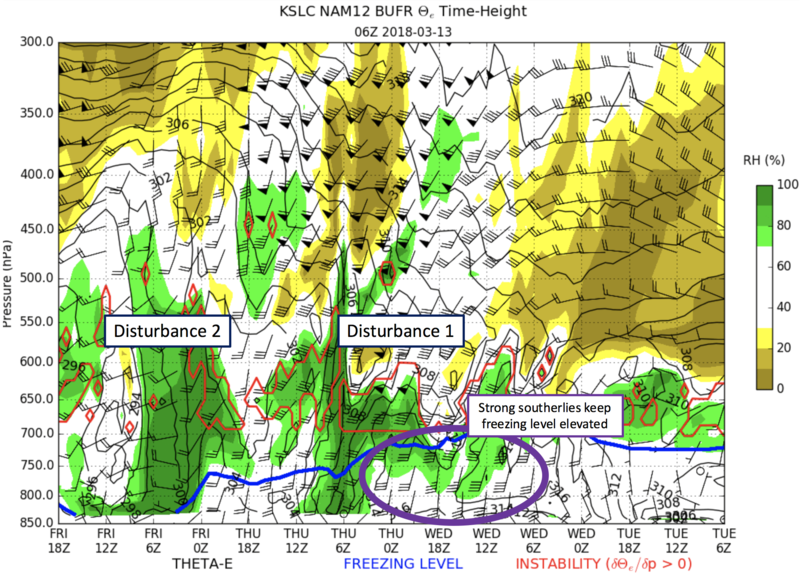 “Known knowns“: Several short-wave troughs will impact our area from Wednesday through Sunday. These short-wave troughs will bring colder temperatures and precipitation from the valley floor to the mountain tops. 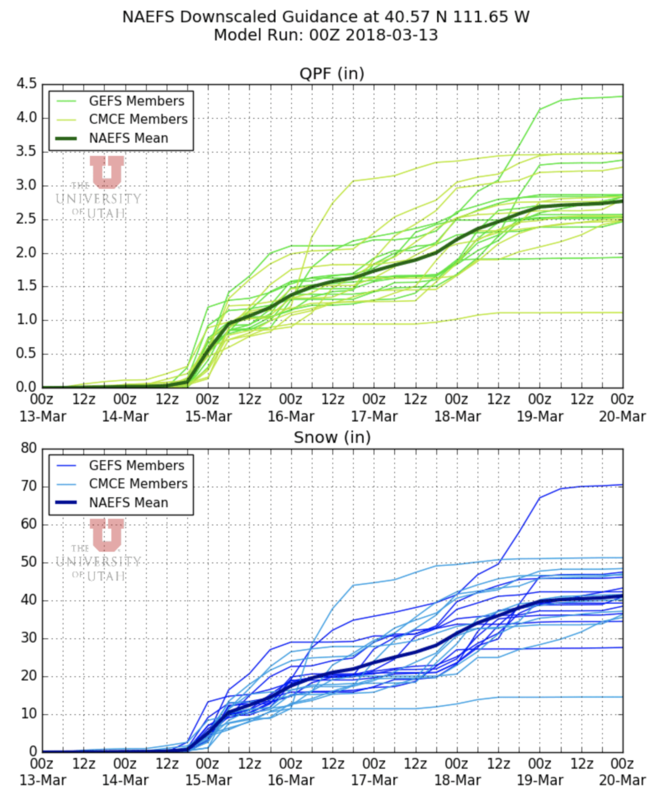 Despite the colder temperatures, weekday snowfall will likely be confined to the high elevations of the Wasatch due to elevated freezing levels. “Known Unknowns“: Timing of each of the tough passages. We have a general idea of the Wednesday – Thursday storm, but as we progress into the weekend, confidence is much lower. We also know that forecasting snowfall totals (especially around the bases of the resorts) will be tricky. The rest of the post will be devoted to explaining what we know and discussing what we know we don’t know. As the week progresses, these known unknowns will become more clear. Today (Tuesday) expect increasing cloud cover with temperatures reaching the mid- to low-60’s in the valley. Tomorrow (Wednesday), strong southerly winds will prevail ahead of the main trough axis, moderating valley temperatures and keeping freezing levels high. A few isolated convective snow showers are possible at crest level during the day tomorrow. Showers will extend to the valley floor in the late evening and overnight hours as a shortwave embedded within the larger trough axis quickly moves through our area. Freezing levels are not expected to drop much overnight, resulting in rain at the resort bases and below. Thursday afternoon into the early evening, a shortwave ejecting from the main trough will move through the area. This will finally bring freezing levels to the valley floor as the flow shifts from southerly to more westerly. Snow will continue through Friday mid-day with accumulations possible down to the valley floor. Remember that the timing on the freezing level dropping/shift to NW flow may change in the next day or so.. Hence the known unknowns we touched on at the beginning of the post. Tomorrow we will have a better handle on when to expect precipitation to start, what kind you will see at what elevation, and a more educated guess of how much. From what we know now: Given the prolonged exposure to the potent available moisture, as well as the instability at crest level, I will forecast that the Cottonwood resorts will see 8-16″ of new snow by Friday. Look for locally higher amounts in areas favored in the northwest flow regime. This weekend we will have yet another chance for wintry precip in the mountains. The low spinning off to our west will slowly make its way into our area. Again, timing is uncertain, but model forecasts like our odds of having a powder day on Sunday. I wont even take a stab at what these totals could be, but enjoy the NAEFS output of liquid and snow to fuel your Tuesday daydreams.